On 30th November 1874, Winston Churchill was born. 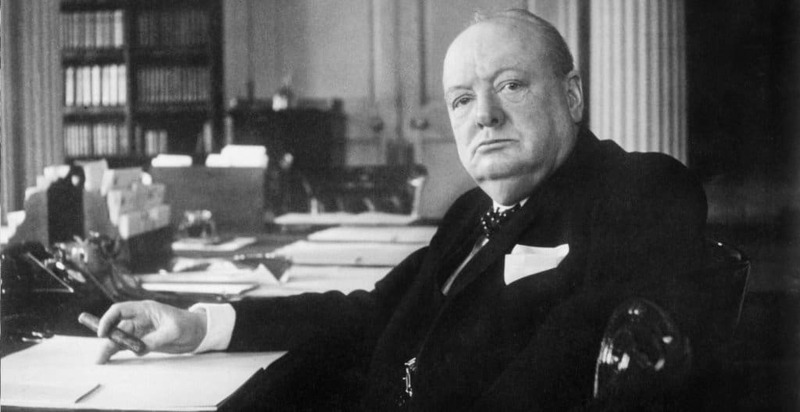 One of the most famous politicians of all time, twice Prime Minister and an inspirational leader in time of war, he would lead Britain to victory in World War Two. Churchill remains to this day one of the most popular and significant figures in political history. Winston Leonard Spencer-Churchill was born at his family’s ancestral home of Blenheim Palace, as a direct descendant of the Dukes of Marlborough. His family occupied the highest echelons of society and he was born into Britain’s aristocratic governing elite. Political office ran in his blood: his grandfather, John Spencer-Churchill had been a Member of Parliament serving under Benjamin Disraeli, whilst his father Lord Randolph Churchill was MP for Woodstock. On his mother’s side he was of American descendant. Jennie Jerome was a beautiful lady from a wealthy family who had caught Randolph’s eye in August 1873; three days later they were engaged. As they say, the rest is history. A young Winston Churchill led quite a dour life early on, unhappy in childhood and failing to get the grades at Harrow, his interest in the military proved to be his saving grace. His father decided it would be a good idea for him to enter the army as a profession and after the third attempt he passed the necessary exams and entered what is now Sandhurst Academy. Whilst at military college he managed to acquire the skills and knowledge to graduate in the top twenty of around one hundred and thirty pupils in the class. In 1895 his father sadly passed away and a young Winston joined the Royal Cavalry. Whilst on leave he entered the world of journalism which found him reporting on the Cuban War of Independence from Spain. By the following year he found himself back in the regiment and travelling to India, where he worked as both a soldier and journalist. He remained posted there for around nineteen months in which time he took part in expeditions to Hyderabad and the North West Frontier. As part of the British Army and working as a correspondent reporting for newspapers back in Britain, he travelled to India, Sudan and South Africa, documenting the unfolding events via newspaper articles and later turning some of the accounts into successful books. During this time he also proved to be outspoken about the issues he witnessed and the handling of events. For example, he did not approve of Kitchener’s treatment of injured captured soldiers during the Anglo-Sudan war. During the Second Boer War, after escaping as a prisoner of war and making his way to Pretoria, he served as a lieutenant in the South African Light Horse regiment and was outspoken in his criticism of the British hatred of the Boers. Upon his return to Britain, Churchill threw himself into political life and in 1900 became a Conservative Member of Parliament for the constituency of Oldham. Only four years later he would change his allegiance to the Liberal Party, commenting about himself in a correspondence that he had “drifted steadily to the left”. He had increasingly associated himself with the Liberals in parliament and aligned himself to several of their interests. In 1903 he had backed the Liberal vote against the use of Chinese labourers in South Africa and favoured a bill which restored the rights of trade unions. He had also been an outspoken critic of the Conservative policy of economic protectionism. His drift towards the Liberals proved inevitable and so when Balfour resigned and the Liberal leader Henry Campbell-Bannerman won, Churchill switched sides and won the seat of Manchester North West. In this early position he served as Under-Secretary of State for the Colonial Office. In this role he was largely involved with decision-making in South Africa where he prioritised making sure equality was established between both parties, the Boers and the British. He maintained a strong stance on issues pertaining to Chinese labour in South Africa and the butchery of Europeans against the natives. Later he would serve under a new Liberal leader. Under Asquith he served in a variety of roles including President of the Board of Trade, Home Secretary and First Lord of the Admiralty. In these roles he was instrumental in reforming prisons, acting as a conciliator during industrial disputes, boosting naval workers morale and arguing for higher pay for the navy. He was steadily climbing the ranks of the Liberal party. In 1914 everything changed with the outbreak of the First World War. Churchill served as the First Lord of the Admiralty which unfortunately involved bad decisions when he oversaw and instigated the disastrous Gallipoli Campaign. As a direct result of its failure and facing heavy criticism back home, he resigned from his position and travelled to the Western Front to fight. By 1917 he had returned to politics and under David Lloyd George became Minister of Munitions and later Secretary of State for Air and for the Colonies. He played a principle role in the Ten Year Rule which allowed the dominance of the Treasury over foreign and economic policies. In the War Office he maintained direct involvement in the Allied intervention in the Russian Civil War, consistently advocating for foreign intervention. In the years between two world wars, Churchill once again changed his allegiance, this time re-joining the Conservative party under Stanley Baldwin and serving as Chancellor of the Exchequer from 1924. It was during this time that he made one of his worst political decisions (an opinion which he himself held on reflection); Britain’s return to the Gold Standard. The consequences were many, including unemployment, deflation and the General Strike of 1926. The year 1929 marked his longest break from politics when the Tories experienced electoral defeat and he subsequently lost his seat. For the next eleven years he would fill his time writing and giving speeches. In 1939 the outbreak of the Second World War saw Neville Chamberlain resign and Churchill become Prime Minister of an all-party war-time coalition government. Whilst he was not the popular choice amongst his own party, his resoluteness and drive impressed the general public. Churchill’s energy belied his age; he was in fact already sixty-five years old when he became Prime Minister. During the war he suffered a few health scares, although this never deterred his determination. His mental health has since also been called into question with many attributing clinical depression or bipolar to his intense moods whilst in office, making him an ornery person to deal with. Nevertheless, Churchill’s strength was his rhetoric, which became a crucial component in the fight against Hitler’s Germany, essential for morale, unity and instilling a strong sense of leadership. On 13th May 1940 as the Germans began their offensive, he gave his first speech famously stating, “I have nothing to offer but blood, toil, tears, and sweat”. This proved to have an exhilarating and rousing effect on parliament, with members responding with cheers and applause. Churchill would make two further evocative speeches during the Battle of France; in June when the Germans were over-running territory and forcing the evacuation from Dunkirk his rallying cry included the iconic phrase “we shall fight on the beaches”. Britain thus was prepared to stand strong in the face of German aggression. In his “finest hour” speech he told parliament that he expected the Battle of Britain to occur very soon, refusing the armistice and uniting the British behind the resistance movement, strengthening unity and resolve across the British Empire. Whilst Churchill has often been respected as a great wartime leader, continually boosting morale and maintaining strong relations with the United States, the blot on his copy book was the destruction of Dresden in February 1945. The result was huge civilian casualties including a large number of refugees. Dresden was a symbolic place, its destruction and the way it happened has been remembered as one of Churchill’s most controversial decisions. Finally, on 7th May 1945 Germany surrendered. The following day, Victory in Europe Day was celebrated with Churchill broadcasting to the country. Whilst at Whitehall he addressed the burgeoning crowds claiming, “This is your victory”. The people replied, “No, it is yours”, such was the relationship between the public and their wartime leader. In the months following victory, the national wartime coalition drew to a close. In the subsequent years Churchill would end up serving as Leader of the Opposition, a position in which he continued to exert a great deal of influence over foreign affairs, famously in 1946 giving his “Iron Curtain” speech. By 1951 he had returned as Prime Minister, keen to prioritise Britain’s role as an international power and involve himself in the project for a united Europe. Further afield, he was forced to confront a changing dynamic with British colonies seeking empowerment and self-rule, for example Kenya and the ensuing Mau Mau Rebellion. It was becoming increasingly clear that Churchill was leading in a time when the world was changing around him. On 24th January 1965 his ailing health got the better of him and he passed away. Six sovereigns, 15 heads of state and some 6,000 people attended his state funeral, the first since that of the Duke of Wellington in 1852, at St Paul’s Cathedral on 30th January 1965. A man of great military might who stepped up to the plate in times of crisis and uncertainty, he was to be remembered as a rousing orator, a person who united the people of Britain in times of great adversity. He was and still is a controversial figure but no one can dispute the enormous impact Churchill had, not just on Britain but the world. Read about the Houndsditch murders of 1910 and the subsequent Siege of Sidney Street of 1911 which left three police officers dead and three more seriously injured.